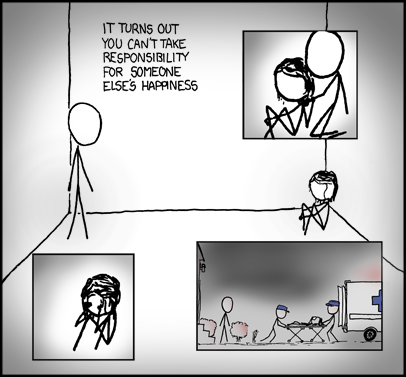 I stumbled across this on xkcd. And I feel that it powerfully affects me. An older friend of mine was was talking with me about this the other day. Someone willing to go so far to take their own life, and do it for their own reasons, is beyond your help. All you can do is go beyond them to save their life; you can’t give them happiness. Likewise, though… Someone who seeks suicide as a way to garner attention is either spoiled on it, or doesn’t know any better and is desperate for affection. It’s the same problem, though; they don’t want to find their own joy. If you give it to them, well… the “give a man a fish” proverb comes into play. But I think I disagree as I did when someone told me 3 years ago. If you care enough about the person to want to save their life, and want to be friends with them, certainly that would help. If you become friends with them, and have fun together, and share the tough times as well as the good, certainly they can change their minds. You can’t “give” someone happiness, but you can give something that can create. Surely if you reach out a little, they would also reach out a little back.